Ah, the soufflé. Is there a dessert more simultaneously loved and feared? While a sunk soufflé might haunt the dreams of many a dinner party host the world over, this horror can easily be avoided with a few tricks and techniques. Before you begin, take a look at our guide on how to make a soufflé to help you approach the dish with a light touch. While a good soufflé is guaranteed to impress, there are few people hard hearted enough to turn down a chocolate dessert either, so why not combine the two? This collection of chocolate soufflé recipes offers some fantastic inspiration for desserts which deliver sweetness and sophistication in equal measure. Daniel Clifford’s easy Chocolate soufflé recipe is a great place to start if you’re new to the dish, resulting in a light, fluffy dessert which is simple to prepare. 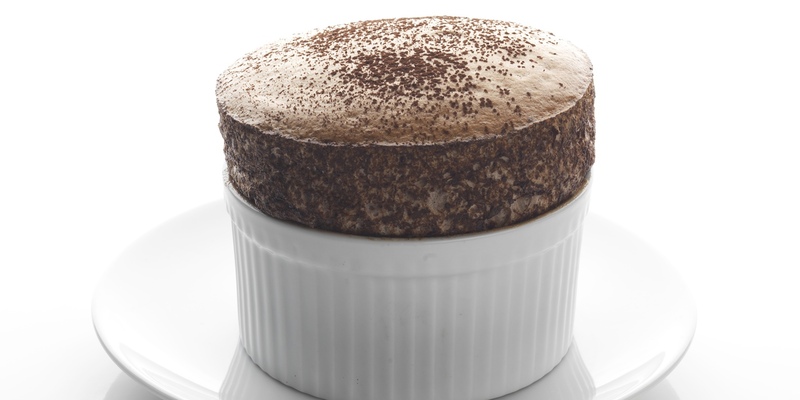 If you’re catering for those with less of a sweet tooth, try Xavier Boyer’s sophisticated Le Soufflé. Relying predominantly on the rich, intense flavour of quality dark chocolate, this striking soufflé recipe uses very little sugar.